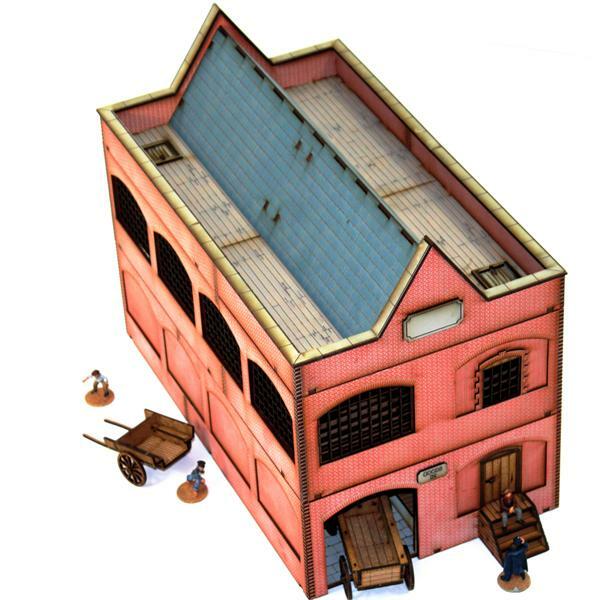 So I’m the lucky chap Phil asked to build and review the slightly exhaustively titled ‘Whitechapel to Baker Street Warehouse’ kit from 4Ground. Retailing at £100, and thus falling in the realm of a premium scenery kit, I was looking forward to seeing if it would live up to its price tag. Worth remembering though that MDF/HDF laser cut terrain seems to fetch a higher price across the industry. Given the size of this kit, and the ‘Level 6’ difficulty sticker on the box, I decided to treat it with respect and proceeded to do a check of all the frames against the schematic provided to ensure everything was present and accounted for. With everything okay I got stuck in locating the required parts. I was somewhat surprised the floor of the building comes in two halves. Looking at the size of the box it was easily big enough to fit a single piece. Other frames included in the kit were also large enough to have accommodated a single floor piece. With the significant weight the building would no doubt finish up as, this struck me as a possible weakness and an unnecessary complication. I ensured the two-floor pieces were glued perfectly flat, and then added the interior and exterior walls to box the basic structure. 4Ground kindly include clothes pegs and elastic bands in the kit for you to use which is fantastic – and an absolute necessity, they are intrinsic to the build and should be used wherever and whenever possible. Happily working my way through the kit I came to a stumbling block. There are a set of columns that run centrally along the length of the warehouse with arches between them, and if you follow the instructions you’ll run into the problem that you won’t actually be able to fit in the last arch pieces. At all. With the walls glued and the columns in place there is no way to fit the tabs of arches into the holes on the columns as there’s no give mainly because of the material you’re working with. On the upside, when it is built, with the floor textures and everything else, it looks the end result looks superb. As you can see from the image above, it looks authentic and robust. That said, instructions could also be a bit clearer with some description to go with the images. And, to be honest, assuming I read them correctly, some of the components were mislabeled. It’s a quite frustrating as, because of the complexity of the kit, you really rely on the instructions and where they deviate you’re on your own a little bit. In the end I had to pull out the columns and lean them diagonally outwards, place the arches pieces between them, and then try to slide all the parts in at the same time, while they were covered in glue which was quite messy. Actually a lot messy. In the end I somehow managed to get all the pieces glued in and unbroken but there is a real risk of breakage, or losing of rags, and then more breakages. But it’s worth remembering that 4Ground have only been around a short while these issues will iron out in time. With that done the build proceeded. 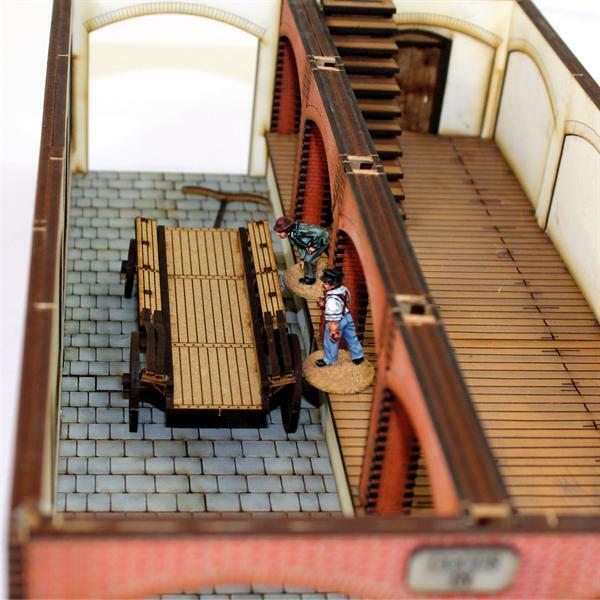 The first floor is almost the same as the ground floor, but with some really nice details that set it apart – the corner office adds a great bit of character as well as having a gaming use. I chose to mix it up a bit when it came to installing the walls and windows to make it little more gaming friendly as it would almost certainly see some grizzly action on the Mordheim board. The instructions have the entire ground floor bricked out aside from the openings at each which gives it an almost fortress like function, but by switching some of the lower brick walls with the first floor window grate’s it opened it up a little without spoiling the aesthetic. And the fact that it was possible to do that highlights the intelligence that lays behind the design. With construction complete I checked to see if the roof lined up with the ground floor and with a little minor trimming it locked in nicely. This modular aspect is really useful as you may not always want to use its full size in your games as it will dominate any board it sits on. But that said, it makes a fantastic centrepiece and if you choose to buy the extra floors, the building becomes a gaming area in its own right. A scenario involving a fight to reach the top floor then becomes compulsory. The victory the spoils. To the loser mockery and shame. A point worth mentioning though is that you do have to decide if you want to build the kit to accommodate the extra floor kits – you receive optional floor sections and an extra staircase for this purpose, but this is only relevant to the first floor construction. You could always build the ground floor and roof sections first to get an idea for its size and potential and decide from there if you would ever want to take it higher. Once finished the building is magnificent and if you’ve made it properly it should be very tough, just watch the corners and edges so you don’t lose any paint work. And one of the best things I experienced during construction was that once I had finally finished building it, it was painted and ready to go. I had been so wrapped up in the build I had completely forgotten that selling point!